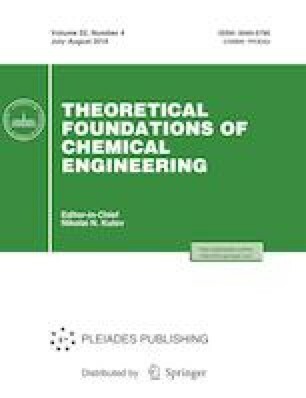 The chemical and energy engineering processes of sintering and calcination, which are of practical importance in the chemical and energy engineering system of the thermal treatment of phosphorite pellets containing free carbon, have been studied. They are thermally activated processes that occur in phosphate raw materials during heating. Some results of thermogravimetric, thermomechanical, structural, and microray analyses have been presented. The multifactor dependence of the sintering and calcination of coke-containing phosphorite pellets has been revealed. The dependence of the strength of phosphorite pellets and the degree of coke burnup on the temperature and the coke content in different heating regimes and the change in the weight and relative expansion of the material of pellets in oxidative and neutral media depending on the coke content and the heating rate have been established. Original Russian Text © V.I. Bobkov, A.S. Fedulov, M.I. Dli, V.P. Meshalkin, 2018, published in Teoreticheskie Osnovy Khimicheskoi Tekhnologii, 2018, Vol. 52, No. 4, pp. 423–430.